Camping out is one of the most popular activities in the Pacific Northwest, but is it really camping if you have hot water, panoramic windows, a large bed, hardwood floors and a full kitchen? 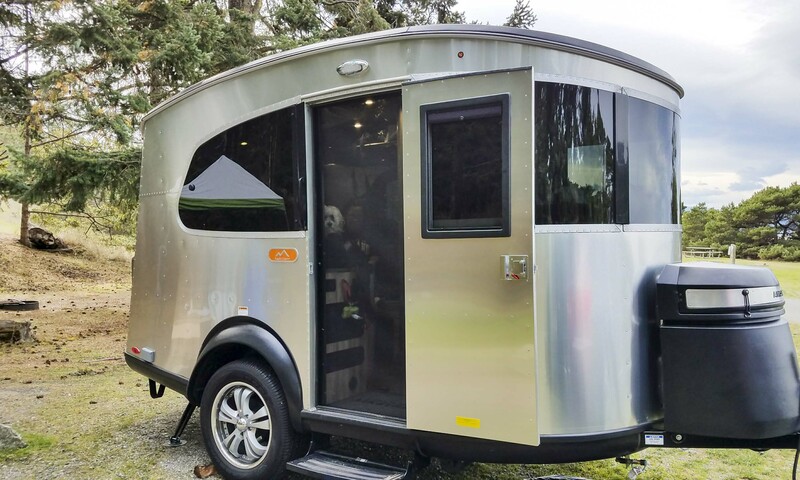 Recently we traveled to Fort Flagler State Park on Washington State’s Olympic Peninsula for a few days in the Basecamp, the latest offering from Airstream. The company knows a thing or two about camping — Airstream has been churning out campers since Wally Byam built the first one in 1929. 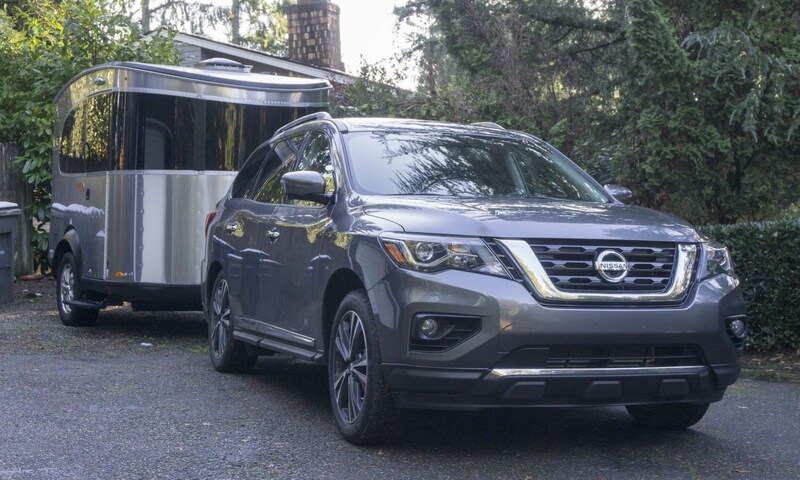 For our trek into the “wilderness”, Airstream provided the trailer, Nissan provided the tow vehicle, and Mother Nature provided the cold, rainy weather as we set out to discover what this type of high-end, small-footprint camping is all about. 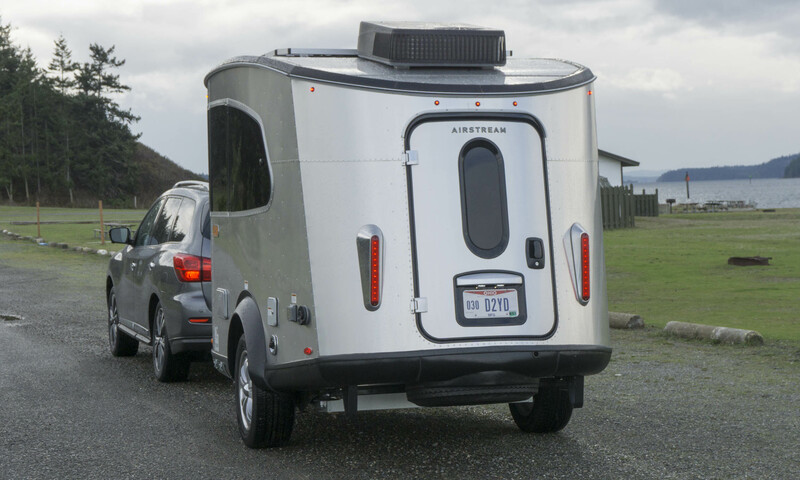 Introduced last year, the Basecamp is Airstream’s entry-level travel trailer. 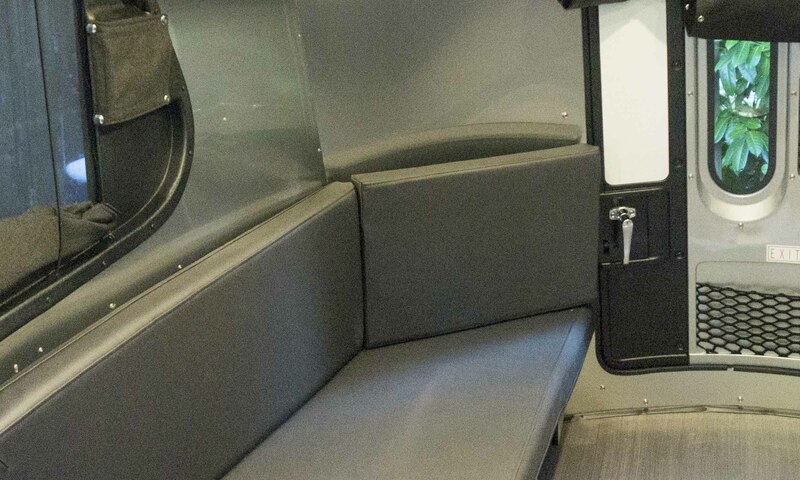 This small but versatile unit has a different look than the typical Airstream and, given its lower price compared to other offerings from the Ohio-based company, it is designed to bring a new clientele into the brand. Reflecting Airstream’s classic aluminum structure and skin, the Basecamp has high-quality materials and features throughout — a foundation on which the company has built its lasting reputation. The Basecamp can seat up to five people, but at the end of the day most guests will have to leave — the Basecamp sleeps two. 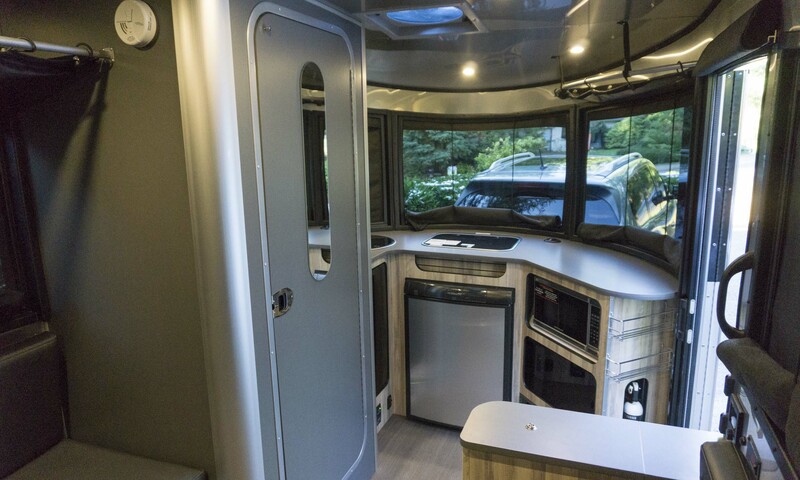 The 2017 Basecamp is slightly more than 16 feet long and 7 feet wide. Fully loaded, the trailer tips the scales at 3,500 pounds. 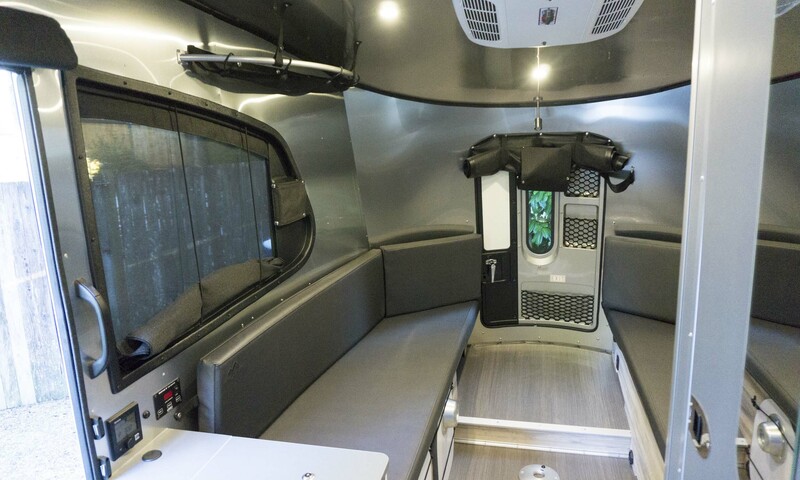 Already well equipped with standard features, our test trailer also featured the optional rooftop solar panels for $1,500, air-conditioning for $950 and a microwave oven for $250. 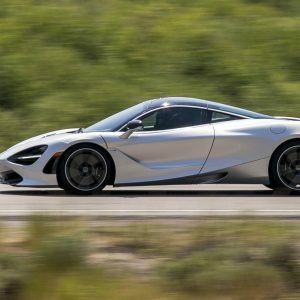 Total retail price as tested: $38,550. Not inexpensive, but a solid value. 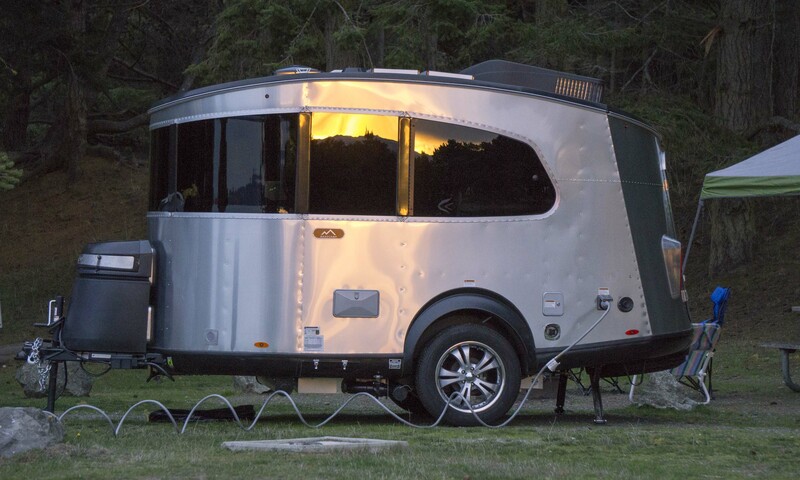 Even though the Basecamp is a new model, this isn’t the first Basecamp to come from Airstream. 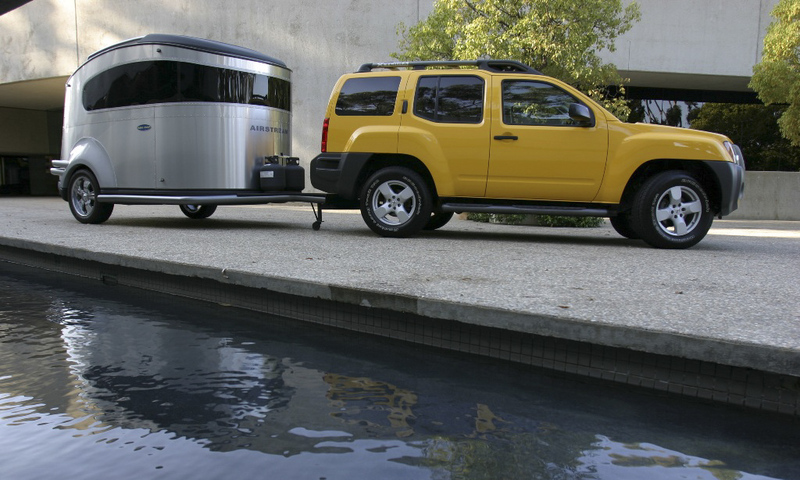 About 10 years ago, Airstream worked with Nissan Design America to create the first Basecamp, which looks similar to the current model, complete with wraparound front windows. However, that Basecamp was designed for those with active lifestyles —it had no bathroom/shower and was geared more for those who were more interested in hauling toys than creature comforts. That may be the reason it never really took off; about 200 were sold during its brief existence. But it became the foundation for this all-new Basecamp. The wraparound, dark windows at the front of the Basecamp are one of its highlights, providing a signature look to the small trailer. The kitchen is located at the front of the unit, so anyone cooking or washing dishes enjoys a panoramic view of their surroundings. The windows also allow plenty of light into the Basecamp’s interior. For such a small trailer, the Basecamp’s kitchen is both versatile and impressive. Numerous under-counter cabinets and drawers provide storage solutions, as well as hammocklike shelves above. Hard covers for the sink and stove provide additional counter space, but even during washing and cooking the galley has more than ample room for chopping, mixing and general kitchen prep. There’s even a spice rack under the stove and a spacious refrigerator/freezer that runs on gas or electricity. 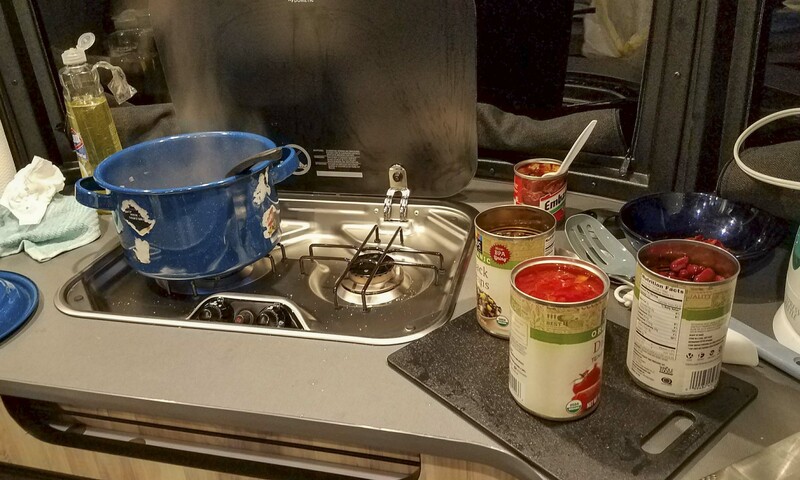 Since our usual mode for car camping is tenting, we felt quite spoiled with running hot water and a powerful two-burner stove at our disposal. The water heated almost immediately, and pressure courtesy of the electric pump made the experience just like home. 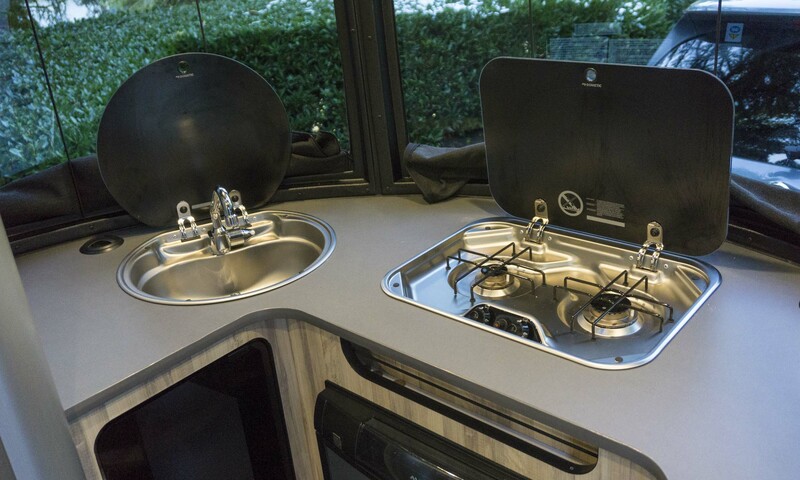 The Basecamp comes standard with a Truma Combi Eco Plus system that heats both the water and the camper’s interior. Camping in the Pacific Northwest during November means temperatures in the 40s; the heater is impressively efficient with two vents that keep the room toasty. At night with the bed in place, one of the vents is positioned beneath the foot of the bed — cleverly warding off complaints of cold feet. 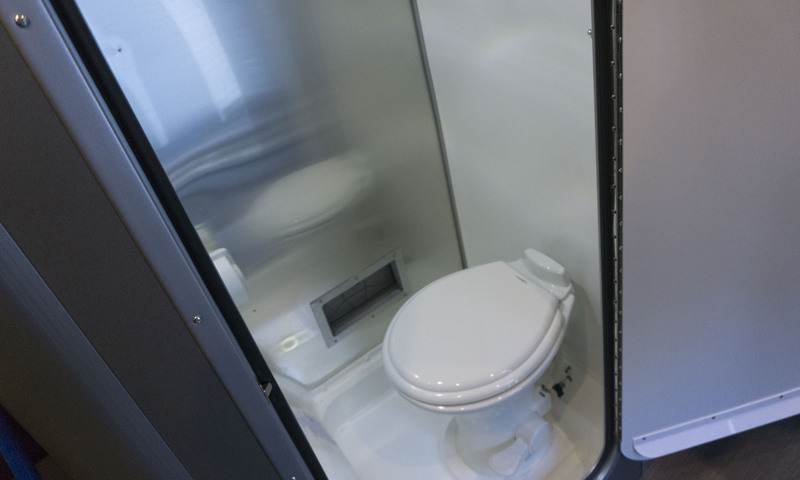 Granted the Basecamp is not a large travel trailer, but with an excellent interior layout Airstream managed to squeeze in a bathroom and shower. For those used to tent camping, this might be the camper’s best feature. The small bathroom has a porcelain toilet, a mirror, hooks for towels and clothes, and a clothes line. The same floor space does dual duty as the shower. The toilet-paper holder seals to stay dry while the whole space becomes the shower. There’s even a pass-through so the handheld shower can be used outdoors as well. A vent in the ceiling helps with moisture mitigation. A holdover from the original Basecamp, the large rear hatch makes loading the trailer incredibly easy. With tables stowed, a long open floor space provides plenty of room for luggage, firewood or even bicycles or a kayak. 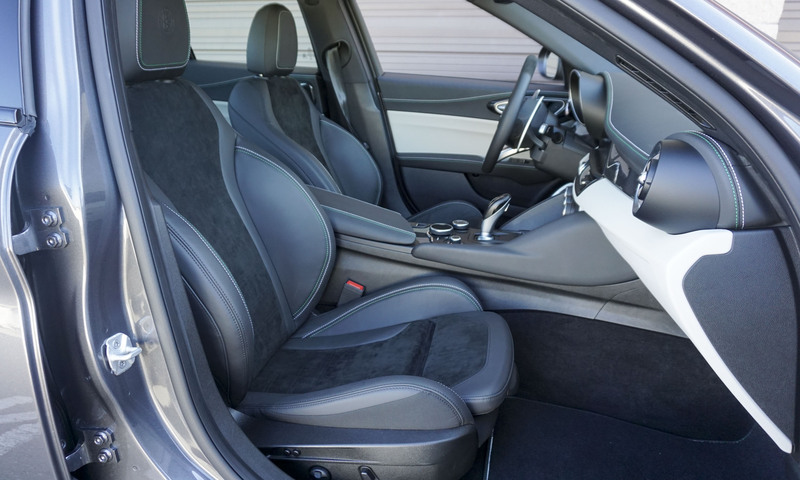 The rear door also has an integrated screen, so when the weather turns warm the rear hatch can be left open for excellent ventilation and an enhanced view out back. Many travel trailers of the Basecamp’s type and size use pressboard and other flimsy materials for walls and cabinets – not so here. 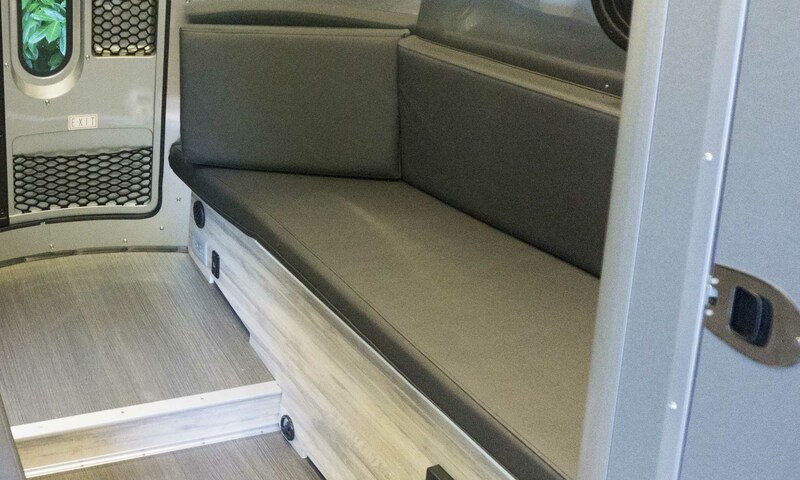 The Airstream may be more expensive than other small campers on the market, but with good reason: solid walls, wood floors and high-quality materials throughout provide an overall feeling of solid construction. Nothing about the Basecamp feels cheap. At the rear of the Basecamp are two bench seats with two small tables that can be set up between them. Additional hammock shelves sit above each bench for storage, and there’s additional storage under the right bench seat. The tables can be set up independently; we discovered that setting up only one provides a bit more room to move around. A common complaint during automobile test drives is the usual lack of power or USB ports; not so with the Basecamp. 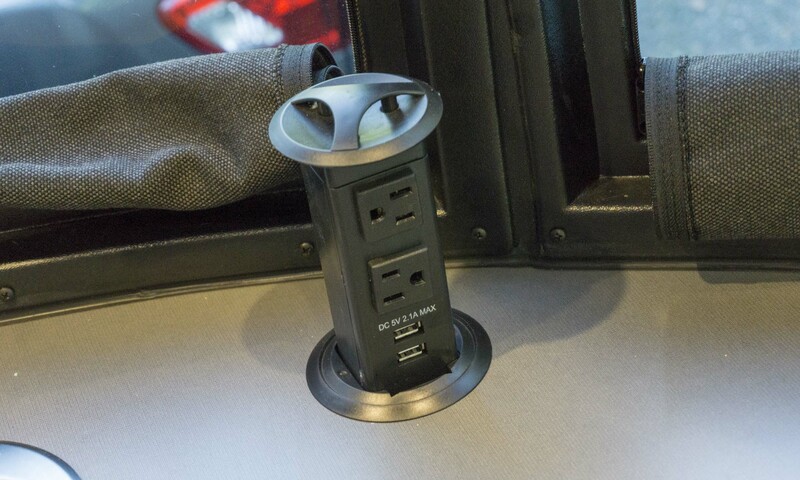 There are six USB ports around the seating area as well as multiple standard 110-volt outlets. In addition, two pop-up power points in the kitchen have two USB ports and two 110 outlets. That’s a total of 10 (yes, ten) USB ports. Setting up the Basecamp’s bed is quick and easy. The two tables get put on shorter legs (stored under the bench) for support, two wooden slats get laid between the benches at the rear, and the bench tops fold out to form a platform. 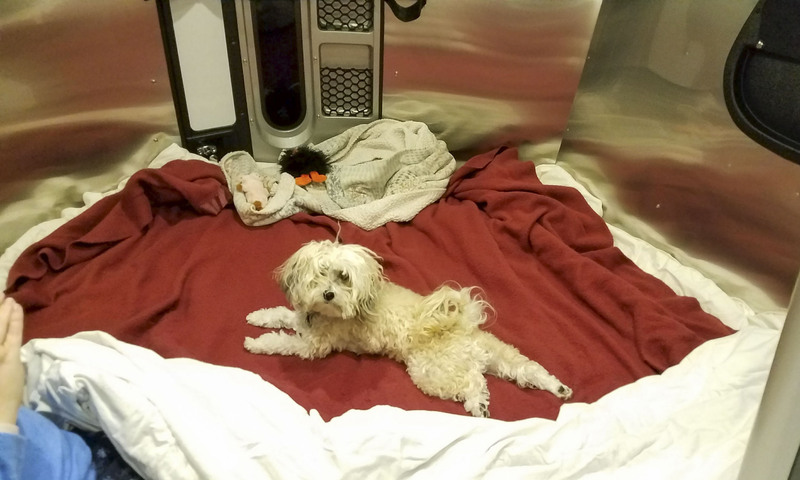 The seat cushions are then positioned with Velcro and voila — a rather spacious bed with room for two (plus a small dog if he’s willing to share). There’s even a reading light at the back of the trailer. The counter next to the main door features lockable storage with two USB ports inside. 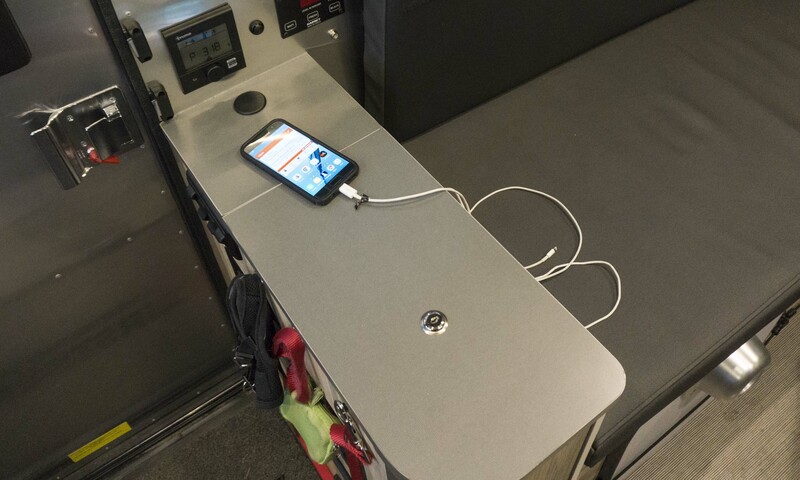 Those who leave their campsite on extended adventures have peace of mind knowing their phones (or other valuables) are in a secure location while charging. The lockable bin also comes in handy as a bedside charging station. 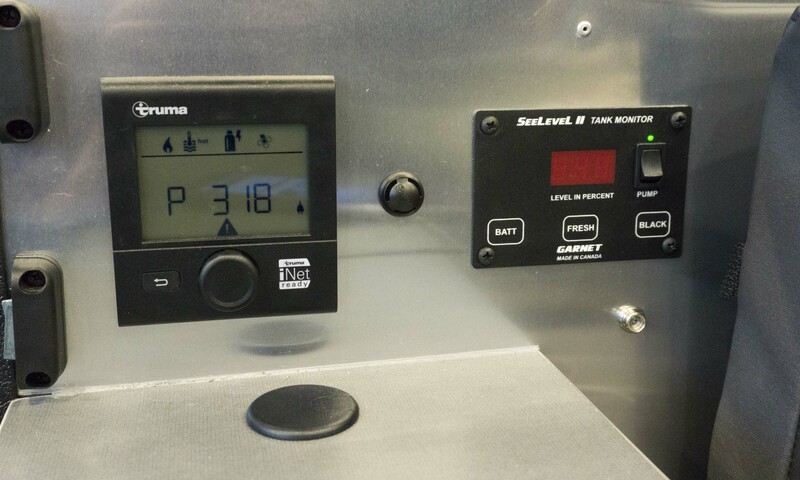 Thermostat controls for the cabin as well as the water temperature are all handled through the same control panel. Although a bit clunky to master at first, once set the controls are simple to adjust for both temperature and fan rate. Gauges also indicate battery level as well as levels in the clean and dirty water tanks. The Basecamp is not as wide as larger camper trailers, which makes towing much easier. 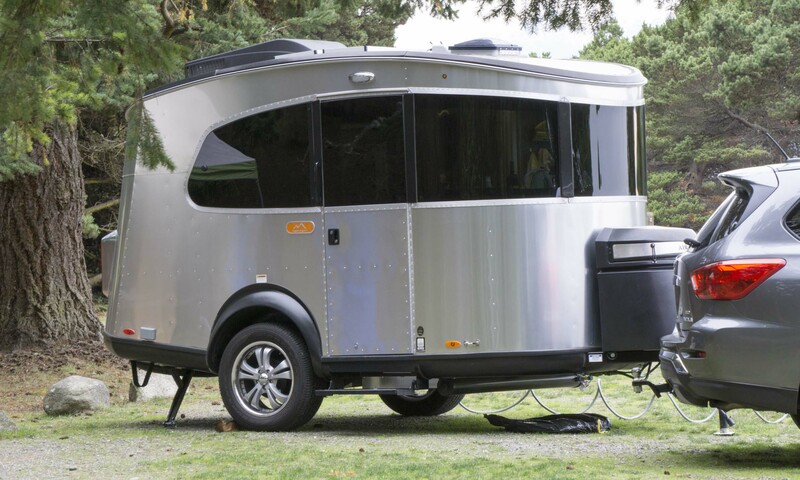 This small Airstream is about the same width as our tow vehicle, making it easy to see around on either side. Maneuvering and backing up are also easy given the compact size. 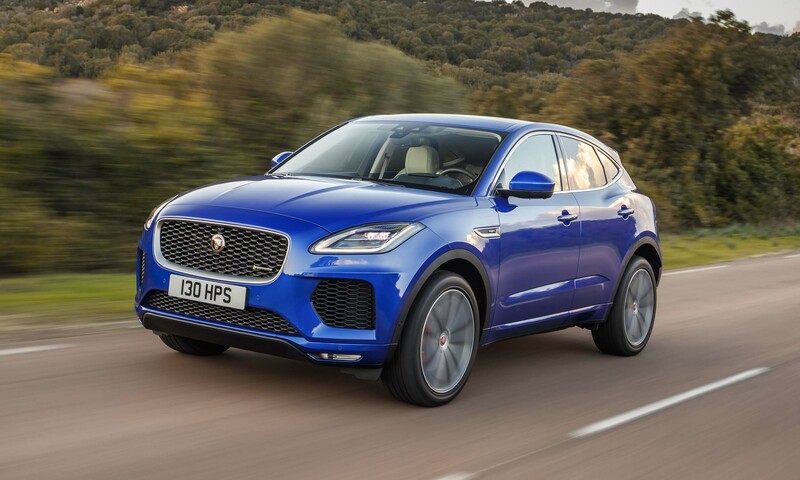 The trailer’s large wheels and high ground clearance eliminate any chance of scraping or bottoming out on steep inclines. 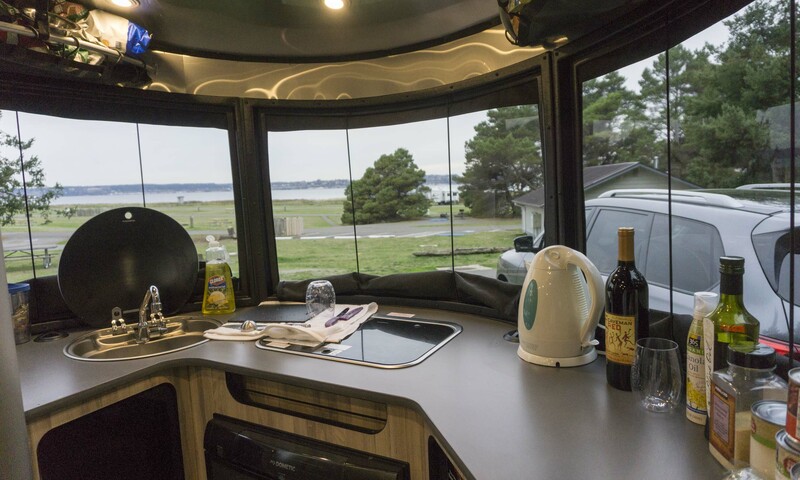 Viewed from outside the trailer, the deep-tinted windows look great and give the Basecamp a striking presence. However, the deep tint meant that it always looks a bit gloomier outside (granted, we were camping during some typically gray, cloudy November in the Pacific Northwest) than it actually is. 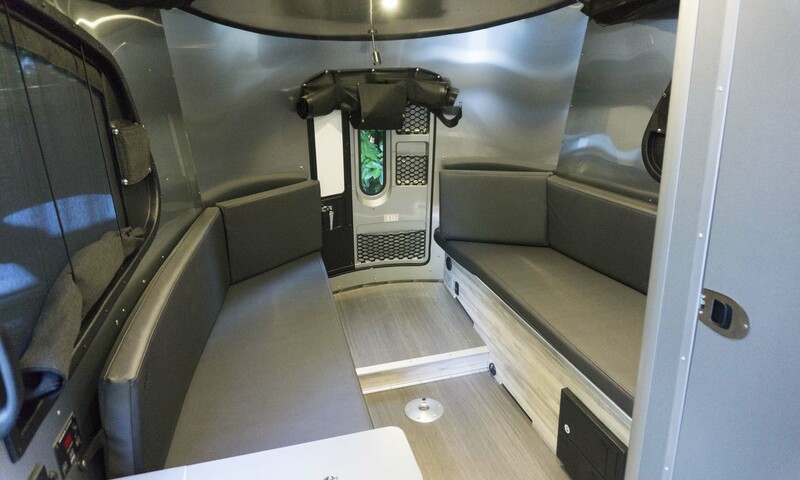 The Basecamp tapers to the rear for better aerodynamics and visibility; however, the curved walls make it difficult to stretch out on the bench seats. Not a huge issue, but we did spend some creative time trying to figure out ways to make the benches more comfortable. The Basecamp’s seat cushions are fine for sitting, but employed as a mattress they become rather thin and uncomfortable. Granted, camping does not need to replicate all the comforts of home, and sleeping in a trailer is MUCH better than sleeping on the ground, but if we were to use the Basecamp for an extended period we recommend adding some padding for additional nocturnal comfort. 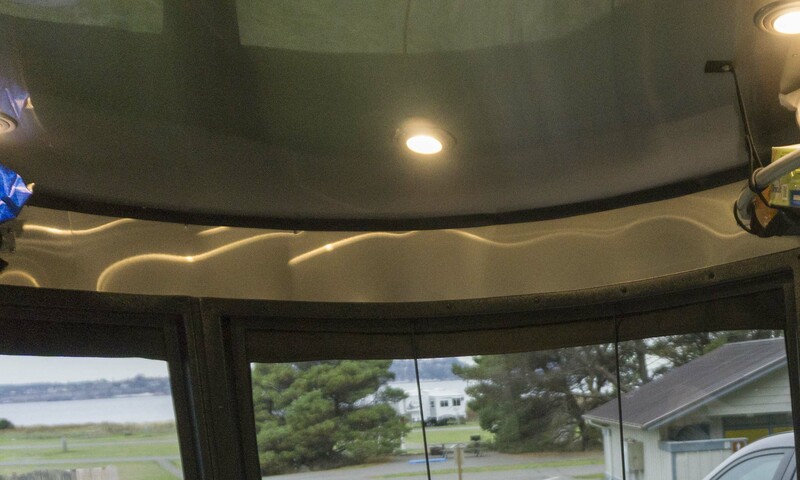 The signature Airstream aluminum walls are incredibly reflective. 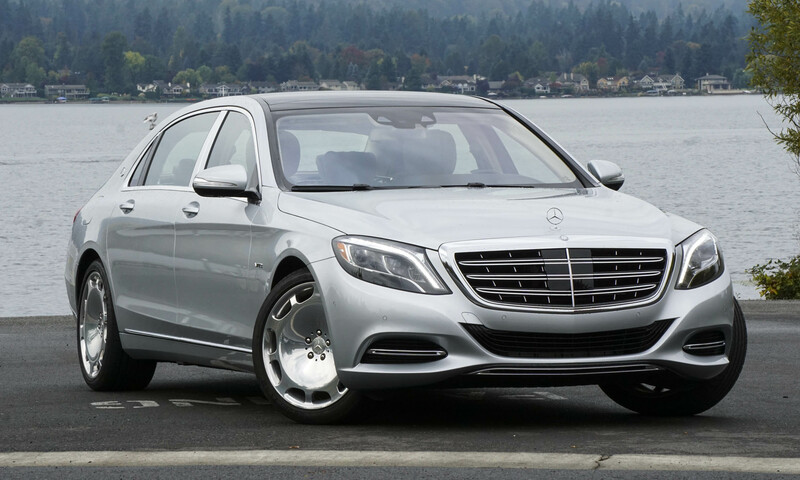 During the day this is not an issue; in fact, the shiny surfaces help brighten the interior. However, at night the walls become a house of mirrors — one little light sends a glow throughout the entire trailer with reflections appearing on all walls. Our tow vehicle for this trip was a 2017 Nissan Pathfinder Platinum 4WD. Given the Basecamp’s collaborative origins with Nissan, the Pathfinder became a serendipitously appropriate choice. 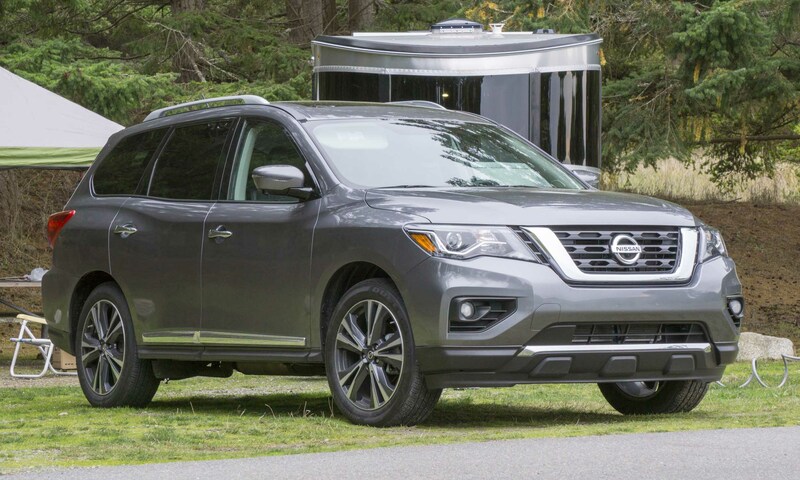 As the name suggests, the Platinum is the top-level Pathfinder and we appreciate the comfortable heated leather seats, high-end audio system and easy-to-use navigation. With the third row folded, there is plenty of room for camping gear; the Platinum’s hands-free tailgate made loading incredibly convenient. The rearview camera also proves its utility when lining the vehicle up with the trailer hitch for hookup. 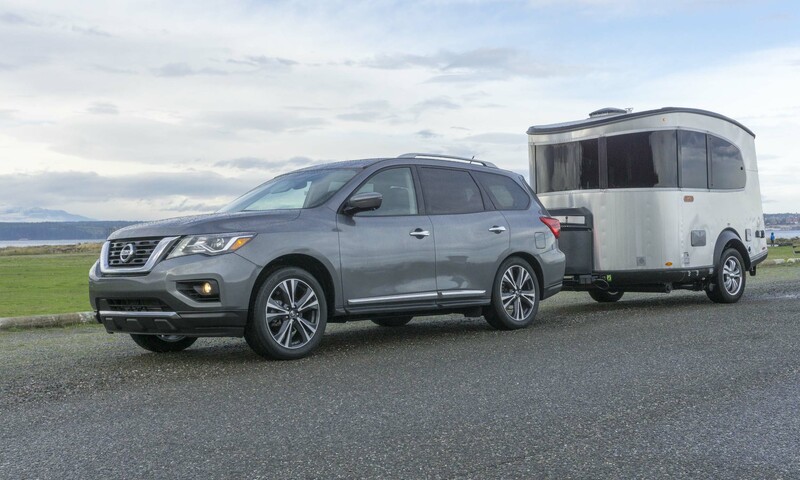 Equipped with a 3.5-liter V6 engine that generates 284 horsepower, Pathfinder has a maximum 6,000-pound towing capacity when properly equipped — more than enough for the Airstream Basecamp. 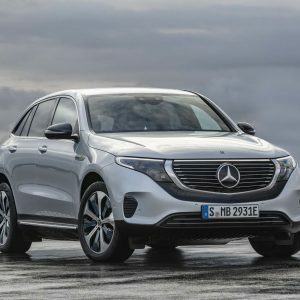 We initially had concerns about using a vehicle with a continuously variable transmission rather than a standard automatic for towing, but this turned out to be a non-issue. In fact, when using the Pathfinder’s Tow Mode the transmission works surprisingly well. 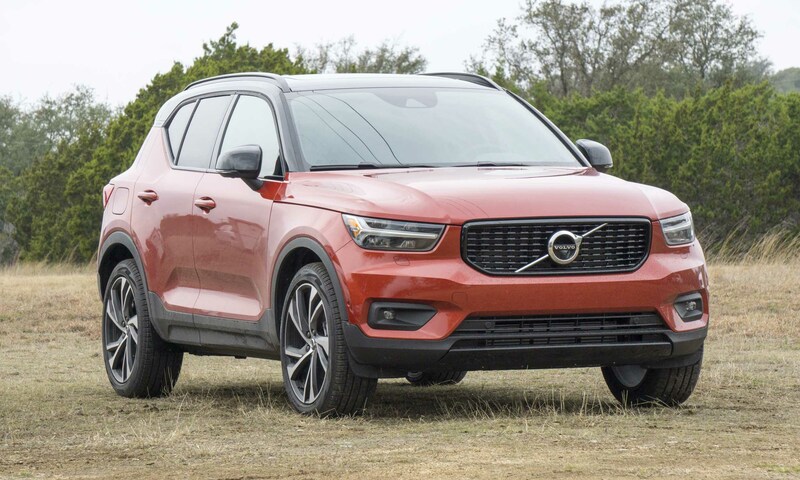 Tow Mode sets the transmission for handling heavier loads, providing excellent torque for easy acceleration from a stop and automatically downshifting for engine braking on downhill sections. 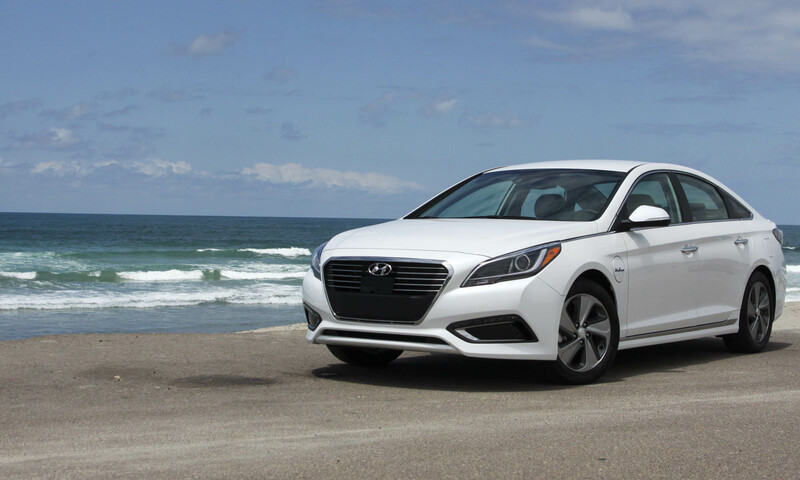 We averaged 15.3 mpg while towing the loaded trailer — considerably better than expected. 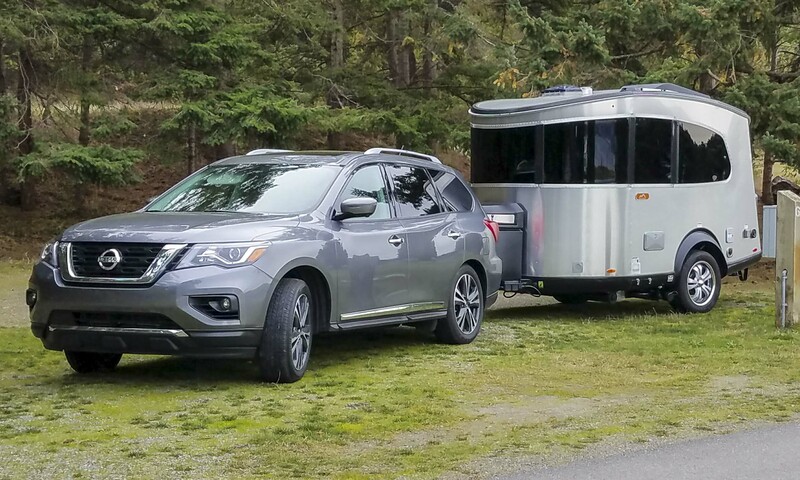 Although the Basecamp’s 3,500-pound GVWR did not come close to the Pathfinder’s maximum capability, we were surprised at how low the SUV rode at the rear with the trailer hooked up. The tongue weight is a bit over 400 pounds, which doesn’t seem heavy considering the Basecamp’s small size. 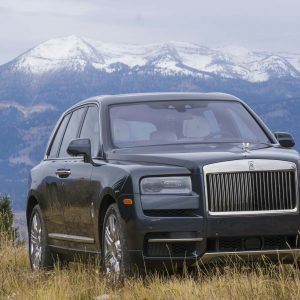 That said, there were no noticeable issues while towing — the front end didn’t feel light, and the entire rig felt stable on bumpy roads and at highway speeds. It may be smaller and shaped differently than its siblings, but the Basecamp is still all Airstream. 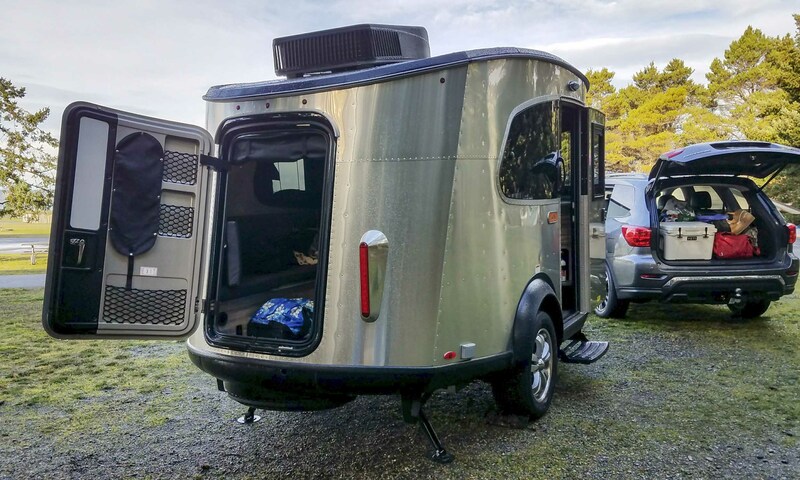 With a small footprint it’s easy to tow and maneuver, while at the same time it makes such good use of interior space that it seldom feels cramped. With (practically) all the comforts of home, the Basecamp makes a great option for those ready to venture into the world of trailering and camping — especially for those who don’t want to rough it too much. 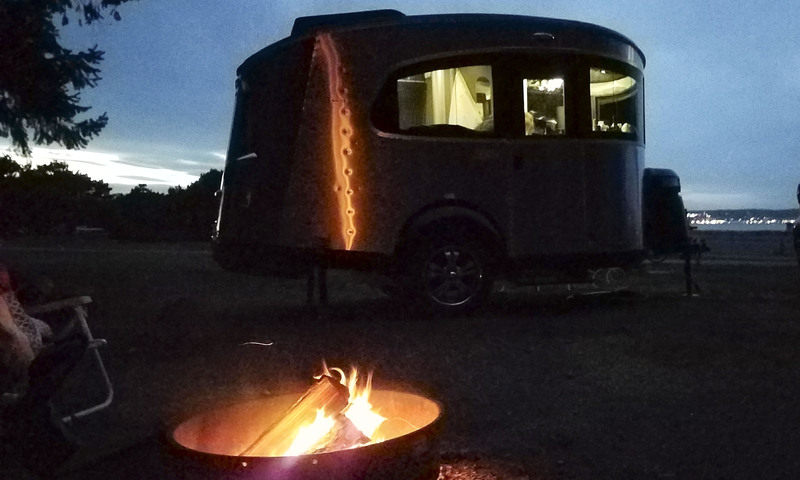 Sure, the Basecamp’s price will be higher than most small trailers; however, taking into account the high level of features and materials, the solid construction, the durability of the aluminum skin and Airstream’s reputation for building high-quality products, the Basecamp is worth the investment if you have the means.